Way back when I first started playing with barcodes as stripe patterns, my first barcode was "Catzee", the name of one of my cats. ...... the wheels started to turn. Considering my recent self-revelation about designing and weaving summer & winter, I decided to use that barcode for my next S&W project. I also considered that even though the draft I had in mind (similar to my Fibonacci S&W) was easy to do out of my head, this would be a good way to begin learning DB-Weave weaving software. Using the entire barcode resulted in a pretty wide draft, of which the screenshot below shows only shows part. You can click on the drafts to enlarge them (they're pretty big). 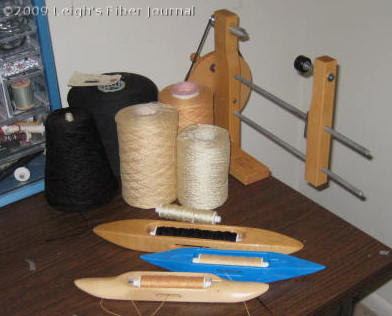 With the Fibonacci drafts, I only had four shafts to work with (and no weaving software). 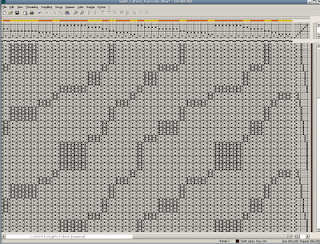 Now I have eight, so the patterns can be much more complex. Interestingly, the draft hints at Catzee's vague ginger tabby stripes. Of course, I don't have these colors to work with, but it gave me the gist of what it might look like. They are the closest Catzee-like colors I could find in my stash. The golds and cream will be the warp and tabby weft. 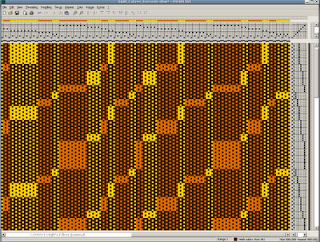 The black will be the pattern weft. I would love to be able to use the black chenille for this, but will sample first. The second black cone of cotton is on stand-by. And of course, since this piece is inspired by Catzee, she reserves full rights to snoopervise the entire project. Lovely weaving idea this is! Looking forward (like Catzee) to seeing this project developing. Great idea!! As is your inspiration. Along with Catzee I am looking forward to seeing the finished project. I always follow your blog with great interest, but now you've got me sitting on the edge of my chair. Get to work! I can't wait! I am *so* looking forward to being home and in a fiber environment. I'm vacationed out. I appear to have a low threshold for sequencing family visits. 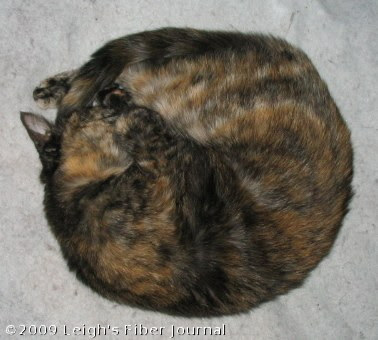 I miss my kitty, I miss my loom. Three more days of vacation, family and reckless spending! What a great idea! I am (like many others) looking forward to seeing the results! 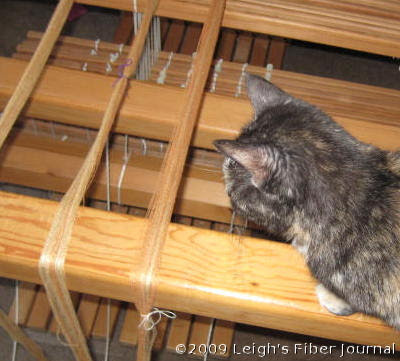 Catzee looks like a good loom cat! What a pretty cat and what a fun idea. It will be fun to see how it turns out. The nine comments before mine have pretty much said it all and I agree your cat is lovely! I'm really looking forward to seeing the end result.